View Poll Results: The first air frost. When? 0.1 days at Castlederg, which equates to one day every 10 years. Very unrealistic. Castlederg may get a freeze in September occasionally but it's not average. Redesdale Camp recorded its first air frost/freeze on 31 August last year. Probably October as usual. I remember the first 'air frost' last October felt absolutely frigid. Freezing weather sounds very appealing right now as I sit in a hot and stuffy room with broken A/C. It's always a shock isn't it? Usually it just comes up out of nowhere and everyones like . It's a bit like aliens have arrived. It's the same with the first snow, it just randomly starts to come. I predict my first freeze (or "air frost") will occur sometime in the first half of November. 50% chance of "air frost" before Oct 1. Ground frost may be earlier, but it's hard to tell. The chance of getting the first air frost after Oct 15 is low, < 10%. 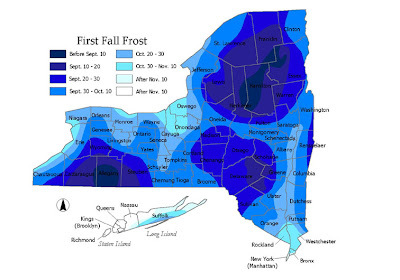 Here's NY's first frost dates. Many areas are in September. Here's the U.S "freeze" average. So one can say frost would happen a bit sooner. Look at Maine, New Hampshire, Southern Vermont, and higher elevations of NY & CT "by October 1st". That means frost is possible in September there. Chicago's first frost occurs between October 21st and 31st, however in the suburbs away from the lake it's earlier usually between October 1st through the 10th. My hometown (Long Island) is after Nov 10! Similar to many oceanic climates! I always like to think we had a bit of oceanic-ness to our climate, about as good as you can get anywhere in the northern US. Well here usually it is about 8c one night and hen it will drop below 0c. There is no clue etc that it is coming. It just randomly comes.